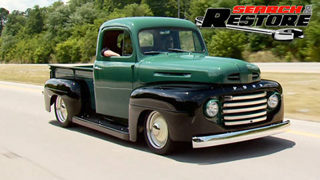 Sheet metal, high tech chassis, and an LS3 with overdrive trans, are just a few of the goodies that get bolted into Chad Terhar's '55 Chevy Handyman. 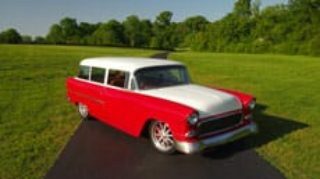 Part one of our '55 Chevy Hot Rod Wagon, where builder Tim Strange and dozens of volunteers make a dream come true for a gearhead viewer. 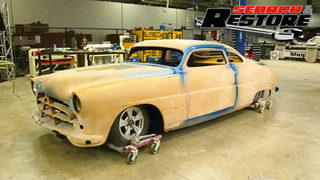 Quickly surpassing two-thousand man-hours in the car so far, the '55 Chevy gets full paint treatment then heads to final assembly. The Terhar family from Tacoma, Washington comes to the Tech Center, along with 4 dozen volunteers who returned to see the keys handed over to our worthy viewer. 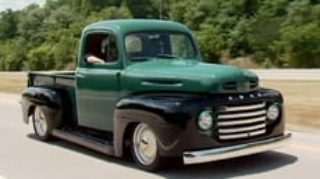 The majority of body panels for the '55 are from Sherman Automotive, manufacturers of high quality computerized engineered OEM style parts for cars trucks and SUV's. 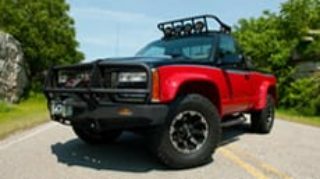 Sherman stocks a broad selection of fenders, quarter panels, and head and tail lamp assemblies, plus thousands of spot repair patch panels. 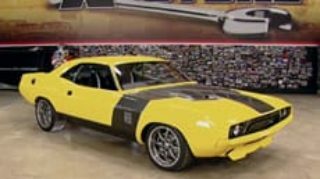 Sherman also is one off the few non-OEM sources for hard to find structural sheet-metal parts like floor supports, wheel houses and rocker panels. A complete line of custom fasteners from high tensile strength fasteners to custom stainless steel button heads plus assorted consumable shop supplies from cutoff wheels to flaps. 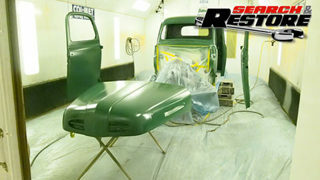 (ANNOUNCER)>> ON THIS EDITION OF SEARCH AND RESTORE, FROM METAL TO MUD, THE '55 CHEVY STARTS LOOKING LIKE A CLASSIC AGAIN, AND OUR VOLUNTEER TEAM CONNECTS WITH THE FAMILY OFFERING UP A SNEAK PEEK AT THE PROGRESS. (ANNOUNCER)>> IT'S BEEN A HECTIC FOUR DAYS IN THE SHOP, WHERE A CLASSIC CHEVY HAS GONE FROM A RUSTED, FADED MESS TO SHINY NEW. ALL TOLD, NEARLY 600 MAN HOURS INTO IT SO FAR, WITH BUILD LEADER TIM STRANGE LEADING THE CHARGE. (TIM)>> ON THIS CAR I WANTED TO KNOCK ONE OUT OF THE PARK. THAT'S WHY I CALLED THIS CREW TO COME IN AND HELP ON THIS THING. MOST OF THESE GUYS I'VE KNOWN FOR A VERY LONG TIME FROM BUILDING HOT RODS AND ATTENDING SHOWS AROUND THE COUNTRY. THIS WEEK, I KNOW I'VE SAID IT BEFORE, BUT AGAIN, IT'S LIKE AN ALL STAR TEAM AROUND HERE. (ANNOUNCER)>> THESE GUYS SHARE MORE THAN A PASSION FOR CARS WITH OUR OWNER CHAD TERHAR, WHO RACED BICYCLES COMPETITIVELY BEFORE HIS ACCIDENT. (TIM)>> WHEN I ALSO HEARD THAT CHAD USED TO RACE BMX AS A YOUNG KID, THAT REALLY HIT HOME. I'M 40 YEARS OLD, I'VE BEEN RACING BMX FOR LIKE 27 YEARS, AND I STILL DO. ME AND MY WIFE RUN A NATIONAL TEAM. WHETHER YOU WIN EVERY RACE BMX'ING, IT TEACHES YOU A WORK ETHIC THAT YOU CARRY IN LIFE. SO THAT'S WHY I CALLED A LOT OF MY BUDDIES THAT EITHER DID OR STILL RACE BMX, CAUSE I KNOW THEY'LL WORK HARD TO FINISH LINE ON THIS PROJECT. (THOM)>> IT ALWAYS FEELS GOOD TO HELP OUT, MAKES YOU FEEL LIKE YOU WANT TO SAVE ONE OF YOUR OWN. YOU MAY NOT KNOW THEM PERSONALLY, BUT YOU SHARE THE SAME INTEREST AND SAME PASSION. NOW WE'VE GOT CARS AND BICYCLES TOGETHER. SO YOU KNOW, IT'S EVEN MORE. (ANNOUNCER)>> TWO PROBLEM AREAS ON THE CAR NEEDED TO BE ADDRESSED BEFORE PRIMER. ONE WAS THE PASSENGER SIDE ROOF. (TIM)>> AT LEAST IT'S NOT RUSTED UP HERE. I'VE HAD ONE THAT WAS SO BAD IN MY SHOP I'VE HAD TO REPLACE THE SKIN BEFORE ON THE ROOF. YOU COULD ACTUALLY SAVE THAT IF YOU WANTED TO. HAMMER AND WELD ALL THAT STUFF. AND SINCE WE DID USE THOSE FULL QUARTER PANELS YESTERDAY, LOOK AT THAT. CUT OUT A CHUNK OF THIS, SHAPE IT JUST A LITTLE BIT, IT'S REALLY CLOSE. ROLL THROUGH THE ENGLISH WHEEL A LITTLE BIT AND WE'LL USE THAT TO SPLICE IN THAT ROOF. THIS METAL THAT I CUT OUT OF THE QUARTER PANEL, JUST A LITTLE BIT TIGHT RADIUS. SO I'M JUST GONNA ROLL IT THROUGH THE ENGLISH WHEEL A LITTLE BIT, STRAIGHTEN IT OUT. I'VE GOT THE RADIUS PRETTY GOOD BACK HERE AT THE BACK ALREADY. THE FRONT, I'VE ACTUALLY CUT THE METAL PLENTY LONG. SO IF I KINDA SNEAK UP ON WHAT I NEED. IT'S EASIER TO CUT OFF METAL THAT TO ADD TO IT. NO TOMMY, IT'S NOT A SUNROOF. (ANNOUNCER)>> THE OTHER PROBLEM AREA COULDN'T BE PATCHED. 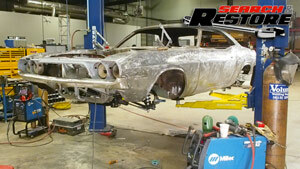 (TIM)>> THE APILLARS ON THIS CAR WERE A LOT MORE RUSTY ONCE IT CAME BACK FROM BLAST. THERE WHERE SOME HOLES THAT YOU COULD STICK LIKE MULTIPLE FINGERS IN ALL TOGETHER IN ONE LITTLE AREA. THAT'S NOT GOOD WHEN YOU'RE TALKING ABOUT THE MAIN STRENGTH OF THE ROOF AND THE WINDSHIELD IN A CAR. (TOMMY)>> I'M NEEDING LIKE THE APILLAR. (TIM)>> SO TOMMY'S IDEA WAS HE FOUND A LOCAL JUNKYARD THAT HAVE TRIFIVE CHEVY STUFF EXCLUSIVELY. I'LL JUST GO DOWN THERE WITH A BATTERY POWERED SAW AND I'M GONNA LOP THEM OFF AND I'LL BRING THEM BACK TO THE TECH CENTER TOMORROW. (THOM)>> TOMMY WENT TO A JUNKYARD YESTERDAY, CUT OUT THESE APILLARS FOR US. WE'RE GONNA TAKE OFF ALL THE RUBBER AND ALL THE TRIM MOLDINGS. PUT THEM IN A BLAST CABINET, BLAST THEM, SAND BLAST THEM, GET THEM ALL CLEANED UP SO WE CAN FIT THEM IN THE CAR. LOOK AT THAT, LIKE BRAND NEW. (TIM)>> IF YOU MOVE METAL AND YOU CUT METAL, RULE NUMBER ONE, DON'T BE SCARED. YOU CAN ALWAYS ADD MORE ON. NOT LIKE WOOD, YOU CUT IT SHORT, IT'S SHORT. GRANDPA ALWAYS TOLD ME, WHAT YOU'D DO THIS TIME SON? CUT IT TWICE AND IT'S STILL TOO SHORT. SO I JUST TOOK MY TIME, KIND OF SNUCK UP ON IT. I LEFT THE PINCH WELDER ON THE WINDOW, SO THE WINDOW FRAME SHOULD STILL BE IN THE SAME LOCATION. I JUST SECTIONED ALL THE METAL IN. MOST OF THE PILLAR, WE CROSS BRACED THE WINDSHIELD SO IT DIDN'T MOVE, LOOKS PRETTY GOOD. THE CAMERA GUYS THAT ARE RUNNING THE CAMERA LIKE RIGHT NOW, THEY THINK OH WE'VE GOT TO CARRY THIS CAMERA AROUND. WE MAKE YOU LOOK PRETTY ON TV. WELL OBVIOUSLY THEY'RE NOT DOING A VERY GOOD JOB. SO CHRIS FROM STREET ROD GARAGE, HE THOUGHT ANYBODY COULD DO THAT. SO HE GRABBED A CAMERA AND HE DID IT, AND HE GOES. (CHRIS)>> I CAN PLAY THIS GAME ALL DAY BABY. I'M FILLING OUT AN APPLICATION BEFORE I LEAVE TODAY. ARE YOU SERIOUS, ALRIGHT. ( )>> IT'S NOT A BOOM BOX. (CHRIS)>> OH THIS IS NOTHING, NOTHING. GRAVY COMPARED TO WHAT I HAVE TO DO. (TIM)>> I CALLED UP OUR FRIENDS AT BUDNIK. THEY DID US A SET OF SPECIAL WHEELS FOR THIS. I ORDERED THE BOLT PATTERN AND THE OFFSET, HAD THEM DO THESE REALLY COOL BRUSHED FINISH GASER WHEELS SINCE WE'RE GONNA DO A LOT OF STUFF BRUSHED ON THIS CAR. THAT MEANS NOT SHINY. (ANNOUNCER)>> UP NEXT WE INVITE THE TERHER FAMILY INTO THE SHOP VIA A LIVE FEED, WHERE CHAD SEES HIS WAGON AS A ROLLER FOR THE FIRST TIME IN YEARS, STAY TUNED. (TASHA)>> IS THAT SERIOUSLY OUR CAR? (ANNOUNCER)>> BACK AT THE TECH CENTER OUR BUILD TEAM TAKES A WELL DESERVED BREAK JUST IN TIME TO CONNECT WITH CHAD FROM HIS LIVING ROOM IN TACOMA, WASHINGTON. (TIM)>> EVERYBODY SAY HELLO TO THE TERHERS. ( )>> HI GUYS! (TIM)>> CHAD, TASHA, AND PAYTON, HEY EVERYBODY. (CHAD)>> HEY, HOW ARE YOU GUYS. (TIM)>> GOOD, WE'VE GOT EVERYBODY HERE. WE'VE GOT GUYS FROM SHOP SAVER CAME, RICK FROM RICK'S TANKS, ROB FROM MBT. WE'VE GOT THOM FROM GODSPEED BACK HERE, THE GUYS FROM BBT, AND WE'VE GOT BILL FROM STARK CUSTOMS. (TIM)>> REMEMBER WHEN WE WERE THERE AND ME AND TOMMY KEPT JOKING ABOUT HOW RUSTY THIS THING WAS? WE KEPT SAYING, WELL AT LEAST THE ROOF IS GOOD, WELL. (TIM)>> THE ROOF WASN'T SO GOOD. WE GOT THIS OUT OF THE ROOF. 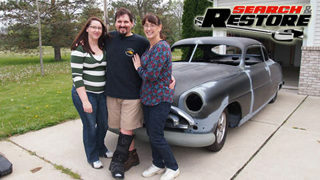 (TIM)>> THIS IS THE FIFTH BUILD OF THIS SHOW, AND YOUR CAR IS THE WORST ONE WE'VE EVER DONE SO FAR TO START. (CHAD)>> GOOD, I'M GLAD I GOT THE TITLE FOR SOMETHING. (TIM)>> YEAH, WE KEEP FINDING MORE HOLES AND MORE PANELS TO REPLACE ON THIS THING. AFTER WE PICKED IT UP FROM YOU, WE HAD TO CALL AHEAD. WE ALREADY HAD A BUNCH OF STUFF ON THE WAY AND WE HAD TO GET MORE VOLUNTEERS TO COME IN, MORE METAL WIZARDS, AND WE'VE JUST BEEN WORKING LIKE CRAZY. SO THE CAR IS ACTUALLY SITTING RIGHT OVER THERE. 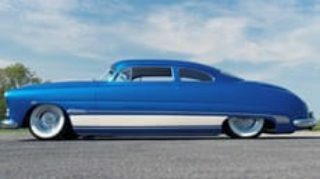 HOW LONG AGO WAS IT THAT YOU'VE SEEN THIS CAR ACTUALLY AS A ROLLER? (CHAD)>> IT'S PROBABLY BEEN A YEAR AND A HALF SINCE I'VE SEEN IT AS A ROLLER. (TIM)>> WELL YOU WANT TO SEE IT A ROLLER TODAY? (TIM)>> OKAY, ROLL IT IN GUYS, HERE IT COMES. (TASHA)>> OH MY GOSH. IS THAT SERIOUSLY OUR CAR. (TIM)>> WELL PARTS OF IT IS. (TIM)>> THE HOOD'S STILL YOUR HOOD. WE DID A LITTLE CUSTOM STUFF UP HERE. WE'VE GOT BRAND NEW FENDERS. WE'VE GOT NEW DOORS. WE FIXED THE QUARTER PANELS. I'M NOT GONNA TELL EVERYTHING THAT YOU CAN'T SEE BUT IT'S GOT AN ALL NEW FLOOR IN IT, A NEW CARGO AREA. DO YOU SEE THIS LITTLE PIECE RIGHT HERE? (TIM)>> WE DIDN'T HAVE TO FIX THAT. (TIM)>> PRETTY MUCH NOT THIS AREA OR THIS AREA, BUT PRETTY MUCH THIS AREA RIGHT HERE WE DIDN'T HAVE TO DO ANYTHING TO. YEAH WE'VE GOT SOME STUFF UNDERNEATH THE HOOD THAT WE ARE DEFINITELY NOT GONNA SHOW YOU TODAY, BUT HOPE YOU'LL BE REALLY HAPPY WITH WHAT WE'VE GOT GOING ON UNDERNEATH HERE. (CHAD)>> YOU GUYS ARE DOING AN AWESOME JOB. (TIM)>> WELL WE'RE NOT GONNA LEAVE IT LIKE THIS. WE'RE GONNA TRY TO FINISH THIS THING UP. SO WE'LL SEE YOU IN A FEW WEEKS. (CHAD)>> THANK YOU GUYS ALL FOR ALL YOUR HARD WORK IN ALL THE DIFFERENT AREAS, AND WE CAN'T WAIT TO GET DOWN THERE AND SEE THE CAR. I JUST WANT TO, YOU KNOW, I CAN'T EXPRESS HOW MUCH THIS MEANS TO US AND JUST WANT TO THANK YOU GUYS AGAIN. WE'LL SEE YOU SOON. (TIM)>> OKAY MAN, LOOKING FORWARD TO IT. LETS GO BACK TO WORK BOYS. (ANNOUNCER)>> NEXT A CAST OF CHARACTERS BRING SOME AMAZING SKILL SETS TO CHAD'S HANDYMAN WAGON. KEEP YOUR EYE RIGHT HERE! (TIM)>> HEY EVERYBODY, COME SEE THE ARTWORK, WHAT THIS THING'S GONNA LOOK LIKE WHEN WE GET HER DONE. 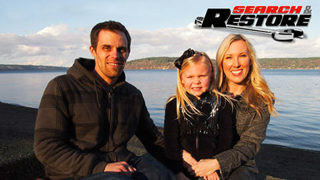 WE GOT JASON RUSHFORTH FROM RUSHFORTH PERFORMANCE DESIGN. HE'S ACTUALLY FROM THE SAME HOME TOWN AS THIS GUY, AND THIS IS WHAT WE'RE GONNA DO. (ANNOUNCER)>> A NEW WEEK MEANS NEW BUILDERS HAVE COME FROM ALL ACROSS THE COUNTRY TO VOLUNTEER THEIR TIME ON CHAD'S SHOE BOX CHEVY. FIRST UP IS BRANDON SISCO, OWNER OF SISCO'S FABRICATION AND BODY WORK IN VISALIA, CALIFORNIA. (JASON)>> TRYING TO STIFFEN UP THE FRONT EDGE OF THIS INNER FENDER PANEL SO IT'LL HOLD THAT STRUCTURE WHEN IT'S IN THE CAR. IT'LL LINE UP RIGHT ON TOP OF OUR FRAME RAIL WHERE WE WANT IT TO BE AT. (ANNOUNCER)>> BRANDON RAISED EYEBROWS AT LAST YEAR'S SEMA SHOW WITH THIS. (TIM)>> BIG OLE BLACK STRAIGHT CADILLAC DUMPED DOWN ON AIR BAGS, RED LEATHER INTERIOR. IT WAS SO NICE EVEN THE GM DESIGNERS PICKED IT AS ONE OF THEIR DESIGN PICKS. 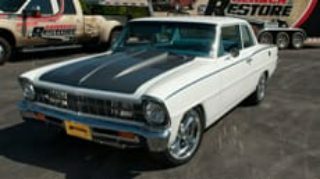 (ANNOUNCER)>> NAMED CRUELLA, THIS '60 DEVILLE WON THE PRESTIGIOUS GM DESIGN AWARD FOR BEST IN SHOW, BUT EVEN AN AWARD WINNING CAR BUILDER NEEDS A PLACE TO LAY HIS HEAD. (TIM)>> I GUESS TROY FROM PRATT & MILLER THREW THE OLD FIREWALL DOWN BEHIND BRANDON, AND HE ABOUT HIT HIS HEAD ON THE CEILING. BUT YOU WORK AROUND THIS CREW LONG ENOUGH, YOU SHOULD BE A LITTLE JUMPY. (ANNOUNCER)>> AND THAT WOULD BE TROY WHITE, WHO ALONG WITH MIKE ATKINS AND BRAD LEFEVOR CAME FROM PRATT & MILLER IN NEW HUDSON, MICHIGAN. THEY AREN'T JUST GOOD AT SPOOKING JUMPY CAR BUILDERS, THEY ALSO KNOW THEIR WAY AROUND SOME CARS. (MIKE A. )>> WE BUILD RACE CARS FOR GENERAL MOTORS. THE CORVETTE AND CADILLAC CTSV, THAT'S PRIMARILY WHAT THE BUSINESS HAS STARTED AT. WE BRANCHED TWO YEARS AGO INTO THE RESTORATION BUSINESS, AND IT HAS GROWN EXPONENTIALLY OVER THE LAST TWO YEARS, WHICH HAS BEEN A REAL GREAT THING FOR US. IT'S DIVERSIFIED US. (TIM)>> THEY'RE GM SPECIALISTS. WE TOLD THEM WE WAS GONNA HAVE A GM PROJECT COMING UP WITH AN LS MOTOR, THEY WERE READY TO COME AND THROW DOWN, AND THEY DID. (KYLE)>> YOU WANT TO SHAVE THAT CORNER OFF REAL QUICK. (ANNOUNCER)>> AND THE PARADE OF HIGH END TALENT DOESN'T STOP WHEN IT COMES TO WHAT GOES INSIDE THE CAR EITHER. (TIM)>> I REALLY WANTED TO HAVE SOME REALLY AWESOME GUYS COME IN AND THROW DOWN HARD ON THE INTERIOR. I CALLED THESE GUYS FROM HIX DESIGN, KYLE AND HIS SIDE KICK ROSS, MAN THEY ARE MAKING PANELS ALL OVER. I HOPE THEY REMEMBER THEY'VE GOT TO COVER ALL THAT STUFF THAT THEY'RE MAKING. 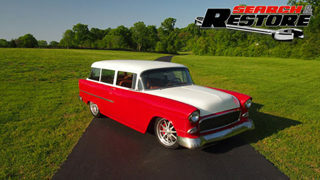 (ANNOUNCER)>> KNOWN FOR CUSTOM INTERIORS LIKE THE ONE THEY WORKED UP FOR THIS '56 CHEVY, THE CREW AT HIX DESIGNS ARE HAPPY TO VOLUNTEER THEIR SKILLS TO CHAD'S WAGON. (ROSS)>> THAT'S WHAT IT'S ALL ABOUT. IT'S ALL ABOUT GETTING THEM OUT THERE. IT'S ALL ABOUT HAVING THE FAMILY ENJOY THE CAR AND GETTING OUT THERE AND DRIVING IT. (TIM)>> TRIFIVE CHEVYS, KNOWN '55, '56, '57, ARE REALLY CLOSE TO MY HEART. MY DAD'S PROBABLY OVER THE YEARS HAD 18 OF THEM. I THINK HE'S GOT THREE NOW. SO, I CAN'T BE WITH MY DAD ALL THE TIME. SO WHEN YOU SEE A TRIFIVE CHEVY, IT MAKES ME THINK OF MY DAD. ACTUALLY MY FIRST CAR THAT I EVER BOUGHT WAS A '55 CHEVY SEDAN I BOUGHT FROM MY GREAT GREAT GRANDPA, PAID $100 BUCKS FOR IT. DUDE CHAD IS GONNA FREAK OUT WHEN HE SEES THIS THING. I'M GETTING KINDA FREAKED OUT JUST LOOKING AT IT. METAL WORK'S DONE, LOOKING LIKE A CAR. YEAH, I CAN SEE THE LIGHT AT THE END OF THE TUNNEL. THE STREET ROD GARAGE GUYS HAVE BEEN A HUGE HELP ON THIS BUILD. FOR THE BODY WORK SEGMENT THEY SENT RAY AND RYAN. (RYAN)>> WE MADE A LOT OF MAGIC THIS MORNING. (TIM)>> YOU KNOW WHAT THEY SAY ABOUT A SHARK? THAT ONCE IT STOPS SWIMMING AND MOVING, IT'S GONNA DROWN. (RYAN)>> WE'RE DOING MAGIC RIGHT HERE. (TIM)>> I THINK RYAN'S LIKE THAT WITH TALKING. (RYAN)>> I'M THE MAGIC MAN! (TIM)>> IF YOU COULDN'T FIND HIM, YOU JUST LISTEN. BLAH, BLAH, HE'S OVER HERE. (TIM)>> BUT HE'S ONE OF THOSE GUYS THAT CAN SAND, WORK, AND TALK AT THE SAME TIME. IT THINK THE FASTER HE TALKED THE FASTER HIS HANDS MOVED. (RYAN)>> BEEN BLOCKING, BLOCKING, PRIMING, BLOCKING, PRIMING, BLOCKING, PRIMING, BLOCKING, PRIMING! AS OF RIGHT NOW I BELIEVE WE'RE CLOSE TO ABOUT EIGHT GALLONS OF PRIMER. (ANNOUNCER)>> THE BODY COMES OFF ONE LAST TIME TO SPRAY THE UNDERSIDE AND TO PREP AND PAINT THE CHASSIS. (TROY)>> OH MY GOD! THAT WON'T BE GOOD. LOOKS LIKE ONE OF THE STANDS THAT WAS SUPPORTING THE HOOD KIND OF COLLAPSED. THAT MIGHT MEAN THAT WE'RE SANDING AGAIN! POSSIBLE SANDING ON THE HORIZON. (TIM)>> THE HOOD FELL, NOW I'VE GOT TO FIX THE TOP SIDE. WE HAD A LITTLE ROUGH ONE DAY. HAD THE HOOD UPSIDE DOWN, SANDING THE BOTTOM OF IT, GETTING IT READY TO PAINT, AND AN OLD STAND THAT WE HAD IN HERE, THE CHAIN BROKE. JUST BAM, DOWN IT GOES TO THE FLOOR. MADE A HECK OF A SOUND, IT WASN'T PRETTY WHEN WE PICKED IT UP. THERE WAS A COUPLE EXTRA DENTS IN IT AFTER IT HAD BEEN PRIMED AND BLOCKED THREE TIMES, AND THEN A BIG CRACK AND ANOTHER DENT RIGHT IN THE MIDDLE OF THE HOOD. (MIKE A. )>> ONE OF THOSE THINGS YOU KNOW. JUST GET AFTER IT, GET IT FIXED, AND GET IT READY TO PAINT. (TIM)>> YEAH, TIMMY HAD HIS FROWNY FACE ON, BUT YOU JUST FIX IT AND KEEP GOING. (ANNOUNCER)>> NEXT, WHAT'S BLOWN APART COMES BACK TOGETHER FOR GOOD, AND WE'LL HIGHLIGHT SOME AFTERMARKET GOODIES THAT'LL HELP MAKE CHAD'S '55 BETTER THAN NEW, STAY TUNED! (TIM)>> IS IT WEIRD THAT YOU NEVER SEE KYLE AND MISTER INCREDIBLE AROUND AT THE SAME TIME? (KYLE)>> I'VE BEEN TOLD THAT BEFORE. (IAN)>> YOU KNOW THEY CALL ME SYNDROME! (ANNOUNCER)>> BACK AT THE SHOP, WITH THE CHASSIS PAINTED IT CAN BE REASSEMBLED FOR GOOD. THAT'LL GIVE TIM A CHANCE TO LAY DOWN SOME TINTABLE URETHANE UNDERCOATING DONATED BY AUTO BODY COLOR AND SUPPLY. ONE PHONE CALL TO DUTCHMAN MOTORSPORTS OF PORTLAND, OREGON, AND THEY CUSTOM BUILT A NINE INCH HOUSING AND UPGRADED US TO ONE OF THEIR HIGH TECH POLISHED ALUMINUM UNITS. A SET OF THEIR STREET/STRIP ALLOY AXLES WILL CONNECT TO A CENTER SECTION, WHICH WAS ALSO DONATED BY RANDY'S RING AND PINION. FOR ULTIMATE STOPPING POWER WILWOOD ENGINEERING SUPPLIED US WITH A COMPLETE SET OF CALIPERS, ROTORS, AND SPINDLES. THIS IS THEIR SUPER LIGHT SERIES FEATURING DRILLED AND SLOTTED ROTORS, SIX PISTON CALIPERS ON THE FRONT, FOURS IN THE REAR. 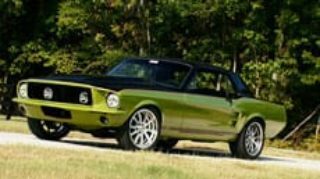 THIS SYSTEM IS ENGINEERED FOR 17 INCH WHEELS AND UP, AND IS A GREAT UPGRADE FOR ANY MUSCLE CAR OR VINTAGE HOT ROD. OURS COMES WITH AN EMERGENCY BRAKE HIDDEN WITHIN THE INTERNAL SHOE SYSTEM FOR A SUPER CLEAN INSTALL. WE POLISH IT OFF WITH A SET OF SPEEDWAY BRAKE LINES. 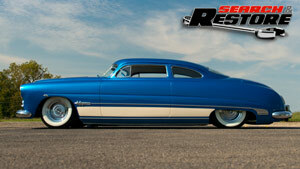 (TIM)>> I'M USING A SET OF RIDE TECH COIL OVERS ON ALL FOUR CORNERS OF THE '55 CHASSIS. THEY'RE A GAS CHARGED FORGED ALUMINUM BODY. THEY'RE ANODIZED, SO THEY'LL LOOK AWESOME AND NEW FOR MANY YEARS. A SET OF THEIR SPRINGS WILL MAKE CHAD'S CAR HANDLE LIKE A SLOT CAR. (MIKE A. )>> BEAUTIFUL BUDNIK WHEEL. (ANNOUNCER)>> JUST AS OUR PRODUCT SUPPLIERS HELP MAKE THIS BUILD POSSIBLE, SO TO DO OUR VOLUNTEERS. A COUPLE OF GUYS THIS WEEK ARE POWERBLOCK VIEWERS WHO CONTACTED US. (TIM)>> BRETT HOWELL FROM BH CUSTOM HAS BEEN EMAILING ME. HEY MAN, COME ON, LET ME BE ON THE SHOW. HE'S HERE UNTIL WE LEAVE EVERY NIGHT, SMILING, HAPPY TO BE HERE. HE'S SANDING, BODY WORKING, DOING ALL KINDS OF STUFF. (BRETT)>> I BUILD PRO TOURING CARS. SECOND GEN FBODIES YOU KNOW, CAMAROS, FIREBIRDS. I'M BIG INTO THE AUTO CROSS THING. WITH THE CHASSIS SYSTEM AND STUFF THAT'S UNDER THIS CAR, THIS CAR, IF IT WAS SETUP RIGHT, IT WOULD DO VERY WELL ON AN AUTO CROSS COURSE. (TIM)>> WE ALSO HAD THIS GUY ANTHONY. I DON'T EVEN KNOW HOW TO SAY HIS LAST NAME. IT'S TIBIDEAX, THIBODEAX. (TIM)>> HIS SHOP, PRO PAINT, FROM SOUTHERN, WAY DOWN IN THERE LOUISIANA. HE KEPT TALKING ABOUT SOME WEIRD FOOD THAT HE WANTED TO BRING, BUT I DON'T THINK I WANT TO. I ATE CRAWFISH ONCE. MAN YOU GIVE THAT GUY A SANDING BLOCK OR A PAINT GUN, AND HE JUST ROCKED IT. (ANTHONY)>> I LIKE DOING BODY WORK BUT I LIKE TO SPRAY TOO. (ANNOUNCER)>> DIRTY WORK ASIDE, IT'S REUNITING THE CAR WITH ITS OWNER THAT ANTHONY ENJOYS MOST. (ANTHONY)>> THE LOOK ON CUSTOMER'S FACES WHEN THEY GET THEIR VEHICLE BACK FROM YOU. CHAD'S LITTLE GIRL, YOU KNOW, THE LOOK ON HER FACE WHEN SHE GETS TO JUMP IN IT. IT'S GONNA BE WORTH IT RIGHT THERE. (TIM)>> YOU READY, YOU READY, YOU READY? SO WE GOT THE CAR JAMBED. THAT'S WHEN WE SPRAY THE ACTUAL COLOR THAT'S GONNA BE ON THE OUTSIDE OF THE CAR ON THE CAR FOR THE VERY FIRST TIME, IT'S PRETTY EXCITING. (MIKE A. )>> REALLY GOOD, REALLY GOOD, IMPRESSIVE, EXACTLY WHAT I WAS EXPECTING. WHY WOULD WE EXPECT ANYTHING LESS? (TIM)>> HE'S GETTING NERVOUS. SO WHILE HE'S GETTING NERVOUS WE PUT THE MOTOR BACK IN AND THE BODY GOES BACK ON. ONCE THE BODY'S BACK, THEN REFIT THE SHEET METAL CAUSE IT NEVER FITS ONCE IT'S BEEN APART. (BRAD)>> I THINK THIS IS AWESOME. THIS HAS BEEN ONE HECK OF A WEEK. A LOT OF GROUND COVERED IN A REAL SHORT PERIOD TIME. ALL THE TALENT, ALL THE BLOOD, GOOD STUFF, GOOD STUFF! (TIM)>> END OF WEEK TWO, A LOT OF HARD WORK. THE BODY'S BACK ON THE FRAME AND SOME OF THE PANELS ARE GETTING ALIGNED BACK ON. THESE GUYS WORKED THEIR BUTTS OFF FOR US THIS WEEK AND I COULDN'T BE HAPPIER. (ANNOUNCER)>> NEXT TIME ON SEARCH AND RESTORE, HAPPINESS IS A WARM GUN WHEN A HOLE NEW SET OF VOLUNTEERS BRINGS SUPERIOR PAINT SKILLS TO THE TECH CENTER.